Balloon and ballast are supposed to be adjustable, but how I do it? Maybe it’s just me, but I found this un­ob­vious: When you click the wrench icon at the top and then the item in the 3D area, you can adjust buoyancy (uplift) res­pec­tively weight. They can only be ad­justed during build time though, not during flight. You need to think of some­thing else to dynami­cally adjust your height. 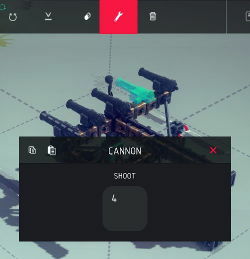 I can only shoot all my cannons at once! Fortunately, that is not true. By clicking on the wrench symbol you can redefine keys for your active building blocks. 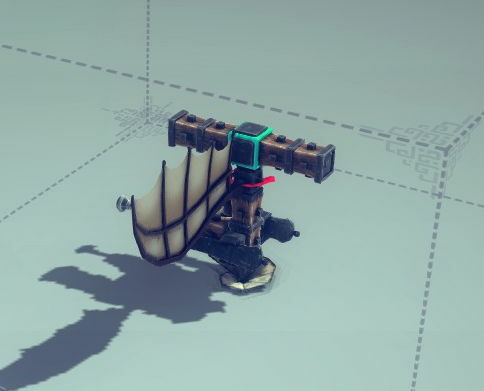 And when you assign a key for a cannon, it is only valid for this specific cannon! So you could e. g. assign the number keys to 10 cannons and fire them individually. 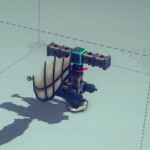 My wings/cannons/whatever end up in the wrong direction! There are actually two different keys for turning items. 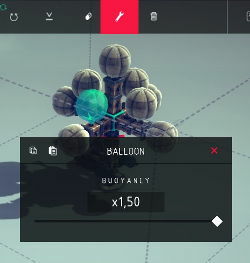 Directions can be changed by pressing F after attaching certain blocks, which is stated in their item description. But others (all?) can be rotated by pressing R when holding them at their attachment point, but before attaching.